Human rights defender from Mazyr Uladzimir Cieliapun received the answer on his appeal to the Constitutional Court. Human rights defender aired his questions and concerns on the meeting with the Head of The Constitutional Court, which was held on the 28th asked the Head of The Constitutional Court a few questions. In particular, he asked to review the decision of Mazyr regional executive committee on mass events that is impossible to be executed for compliance with the Constitution. According to this decision the applicant of a rally or a picket has to make agreements with special services before getting the permit from the executive committee. The special services deny making agreements with reference to absence of permission on holding the event from the executive committee. Human rights defender asked local authorities, regional authorities and courts how to deal with this matter, what are the ways of execution of this decision of the executive committee, but received no reply. 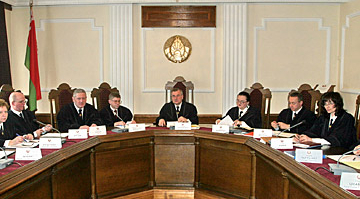 The reply from the office of the Constitutional Court contains no information on the merits. It is said in it, that: “supervision over precise and uniform execution of legislation in the sphere of local and self-government is performed by General prosecutor and procuracies, subjected to him”. According to this reply from the office, citizens “apply with initiative of making suggestions that the Constitutional Court is in charge of to the President and authorities that are entitled to make suggestions to the Constitutional Court”. rights defender commented on the reply from the office of the Constitutional Court.